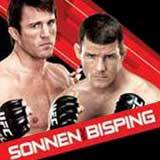 Review: 2012-01-28, two stars for Chael Sonnen vs Michael Bisping since it was not a particularly exciting fight. Chael Sonnen (26-11-1) entered as the No.2 middleweight in the world while Michael Bisping (22-3-0) entered as the No.9. Sonnen vs Bisping is on the undercard of Rashad Evans vs Phil Davis (UFC on Fox 2). Watch the video!